When did you first identify as a scientist? What does your work center on today? That's a hard question! I first started identifying as a scientist the moment I first referred to myself aloud as "a scientist" to a complete stranger. I was in grad school in the Department of Chemical and Systems Biology (a mouthful, I know!) studying proteostasis in a mass spectrometry-based proteomics lab (another mouthful!). I was spending my days doing experiments and analyzing data, and my nights dreaming about experiments and data. At the time, I was also working on my first scicomm exercise – polishing my 5 second, 30 second, and 60 second elevator pitches. I was doing this exercise mostly because I’d come to realize that it took forever for me to answer the question, “What do you do?” to someone outside of my field. All of that back story leads to this: one day, while in line at the grocery store, the stranger standing next to me asked me, “What do you do?” And I replied, “I’m a scientist.” Before then, I’d considered myself a student, an undergraduate researcher, a junior specialist, a graduate student researcher, and a scholar, but never a scientist. Oddly enough, this 5 second conversation with a stranger was the moment that I shed a bit of my imposter syndrome and I became comfortable seeing myself as a scientist. I now work for a consulting company that contracts to the National Cancer Institute Center for Biomedical Informatics and Information Technology (CBIIT). At CBIIT, I'm a program manager and I help facilitate several projects related to data sharing and translational research. Since scientific fields like genomics and proteomics (defined in the next question) generate large amounts of data, there is a real need for sustainable computational infrastructure to support the analyses of these large data sets. One of my main focuses is the NCI Proteomic Data Commons, a cloud-based infrastructure for storing, sharing, and computing on proteomic data. The overarching goal of the Proteomic Data Commons is to empower scientists to combine proteomics with genomics and other types of data to improve our understanding of cancer, thus enabling precision medicine approaches to cancer research and care. Another project that I support is a public-private partnership called Accelerating Therapeutics for Opportunities in Medicine (ATOM). ATOM's goal is to use artificial intelligence to help speed up the development of cancer therapies. The current drug discovery and development process is really slow and expensive. There are a lot of factors that go into the development of a cancer drug - What problems happen within a cell that ultimately cause the disease? Can we identify a chemical or biological molecule/drug that can be used to correct these problems? Is the drug safe to use? Are there any side effects? Is the drug effective? What dose works the best? (just to name a few). Researchers at ATOM are using artificial intelligence and other emerging technologies to answer some of these questions more quickly and inexpensively. Can you explain the difference between Proteomics and Genomics? Why is it so important to understand what proteins do? I’ll start with genomics because lots of people have heard of 23andMe or AncestryDNA, which are becoming popular ways of getting a snapshot of your genes and associated traits. Half of your genetic material (DNA) comes from your mom, and half comes from your dad. All of your genetic material is called your genome, and genomics is the scientific field that studies genomes. Genes encode proteins which are functional molecules in cells. A proteome is the entire set of proteins in a cell, tissue type, or organism, and proteomics is the scientific field that studies proteomes. A proteome is determined by a combination it’s associated genome and environmental cues. While all of the cells in your body have the same genome, proteomes can vary from cell to cell, tissue to tissue, and person to person. When specific mutations occur in genes and when specific proteins become dysfunctional, diseases like Alzheimer's, Parkinson’s, multiple sclerosis, and cancer can arise. Scientists use proteogenomics, the combination of proteomics and genomics, to get a more complete view of how diseases arise, progress, and in cases like cancer, recur. The better we understand the molecular underpinnings of diseases like cancer, the more effectively we will be able to treat and even prevent them. You have a good mix of mentorship and teaching experience, what has been your favorite part of mentoring scientists in the making? I have mentored students and technicians in the lab, taught at the graduate level, and also volunteered at a local middle school. These experiences were always highlights of my day, and helped me maintain balance especially on days when experiments weren’t going as planned. These experiences also helped me figure out that I wanted a career where I could in some way be of service to the scientific community. 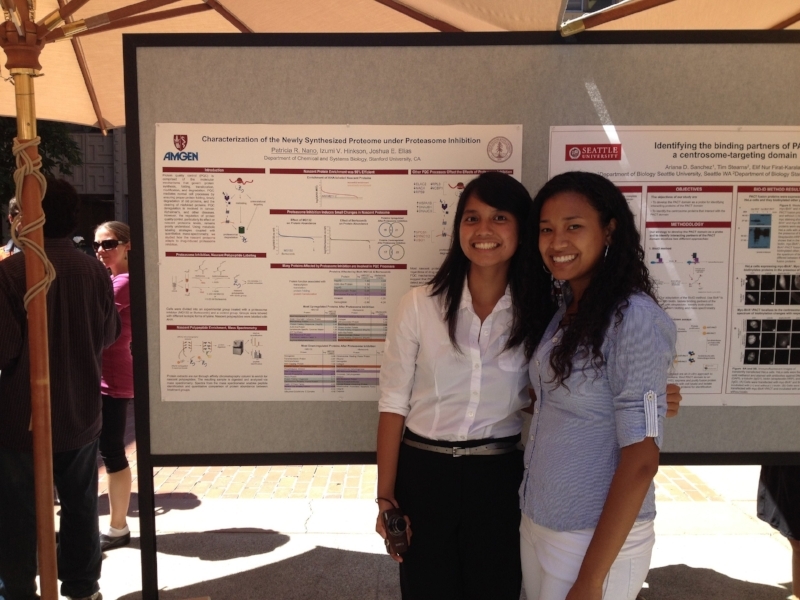 One of my most rewarding experiences was mentoring an undergraduate student as part of a summer research program. My lab mates and I nicknamed my summer student Nano-Zoom because she was a nano version of me. She’d already had some research experience back at her university, but she'd never done any proteomics before. Over the course of that summer, I helped her plan a small research project that combined molecular biology, chemical biology, and quantitative mass spectrometry. After only a few weeks, she was able to start working more independently and I was really excited to see the amount of progress she made in such a short period of time. The next year, Nano-Zoom was accepted into my department's PhD program; she's now a PhD candidate studying chemical biology and I’m a very proud mentor! How did you start working at the intersection of medicine and data? Do you see any near-term challenges or breakthroughs with data sharing in the biomedical field? As an undergraduate student, I joined a research lab that used mass spectrometry to study prostate cancer. Mass spectrometry allows scientists to do a range of quantitative experiments that can focus on a handful of proteins or thousands at a time. I had never even heard of mass spectrometry until I joined my first lab, but I quickly learned that it was a powerful method for studying biology and was hooked. Mass spectrometry-based proteomics and other large-scale biotechnologies generate lots of data, and to maximize the use of these data, we need research standards, sustainable computational infrastructure, and the ability to combine and co-analyze disparate data types (e.g. proteomics, genomics, metabolomics, radiological imaging, epidemiological data, clinical data, and patient-reported outcomes). Several organizations are working towards solutions to these challenges, but I think the most vital piece of the puzzle is the need to train burgeoning scientists to speak the languages of these different scientific fields and understand the nuances of each data type. Interdisciplinary research programs are becoming more and more common at universities and research institutes, so it will be exciting to see what innovations in analysis, inference, prediction, and visualization are spurred by enhanced cross-disciplinary data sharing. Perhaps the most important question we ask of all, when you're not science-ing, teaching or communicating science, what do you do to unwind? My hobbies generally revolve around food and soccer. I was raised in a multicultural household, so I love cooking and eating different types of savory foods from around the world. Whenever I go on vacation, I prepare a spreadsheet of restaurants and plan my trip around that. Some of my friends like to make fun of me because of it, but I find it to be very efficient… and also delicious! Another part of my family heritage is a love of soccer. I grew up watching my grandfather, dad, uncles, and brother play soccer, so when I was five years old, I begged my parents to sign me up. I was terribly unathletic my first few years, but I eventually got the hang of it and have been playing ever since. I have a lot of happy memories tied to the pitch – road trips to soccer tournaments for my dad’s, brother’s, and my teams, celebrating wins by sliding into the mud with my teammates, watching the World Cup and Euros while working in the lab, waking up at 4:30am to watch the Premier League live with my partner, and even celebrating many birthdays (friends’, family members’, and my own) while still in my gear. I currently play in a couple of co-ed rec leagues and when I'm not playing soccer, I'm probably watching it. I’m a big Arsenal fan (which, as any Gooner knows, can be emotionally distressing at times), but I love to sport and love the club so #COYG!